MTN Elite One 2012. The league, consisting of 14 teams, has reached the halfway mark and Aigle Royal, based in Dschang in Western Cameroon, will most likely face a struggle to retain their status as a top level side. Aigle Royal has traditionally been good in developing talented players. Therefore, I decided to take a closer look at their current squad. Aigle Royal has two goalkeepers fighting for the number one shirt – Jaguar Kilama, sometimes referred to as Benjamin Kilama, and Leonard Ngam. As far as I know, Kilama, formerly of Astres Douala and Tiko United FC, is the most experienced. Kilama was preferred at the beginning of the season but Ngam seems to be first choice at the moment. Abdoulaye Alingar, formerly of Achille FC from Yaoundé, is a central defender and one of the players who have stood out. Francois Ndongo Mpessa is a central defender who has been captaining the team several matches. It is currently somewhat unclear to me if this is the same Mpessa who played for the Cameroon national football team in 1997 and played professionally in South Africa, Malaysia and Indonesia. If so, Mpessa is 33 years and one of the oldest players in the league. Another experienced player is defender Richard Ngote (born 15.07.1984), formerly of Sable FC. I know that Boheu has been awarded “Meilleur Joueur”-awards in a couple of matches this season and I believe it is fair to say that Boheu is one of the key players of Aigle Royal. Yannick Gaël Ntonme, formerly of Tiko United FC, is also a key player in defence. Aigle Royal recently signed Thierry Nyangoua, formerly of Unisport FC and Panthere Sportive, to beef up the defensive line-up. Lenekourman Baidam (born 02.04.1984) is one of the veterans of the team, often playing as a defensive midfielder. Baidam was mostly used as a striker at his former clubs, including Cotonsport FC, Espérance de Guider, Douala AC and Roumde Adjia FC. Strongman Rodrigue Djithe and Baba Oumarou (born 04.11.1986), who has top level experience with Canon Yaoundé and Sable FC, are important players in midfield. 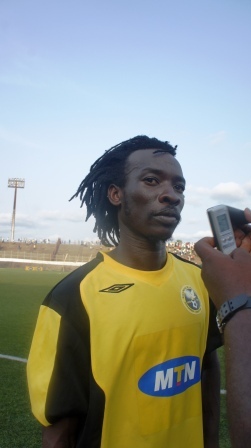 Attacking midfielder Wilfrid Etondo, formerly of YOSA, was part of the Cameroon B national football team in 2009. Etondo decided to travel to the Republic of Congo, starring for Diables Noirs from the Congolese capital of Brazzaville. Etondo made the first eleven for Aigle Royal in the first match of the season, but I have not seen him feature ever since. I don’t know if Etondo has left the club or if he is injured but normally, he would be a key player for the team. Gautild Monsio Abissama (born 11.03.1991) has been one of the revelations of the seasons and the former player of Achille FC is currently top scorer at Aigle Royal with three league goals. David Mpouma is an experienced striker, formerly of Union Douala, who has mostly been used as a substitute. The picture is of Mpouma and is taken from 45fois2.com. Landry Nguene and Nana Arnaud Njeukou are two other attackers who have mostly been shooting blanks this season. Nguene, formerly of Ngaoundéré University FC, was part of the Cameroon U-20 national football team earlier this year. Njeukou is a former player of Union Douala and Matelots de Douala. Aigle Royal recently signed experienced attacker Alain Rodrigue Djomou (born 22.10.1985), formerly of Panthere Sportive, and Alassane Mongbet, formerly of Union Douala. Victor Kueti Edepan, Pascal Achille Mvogo Ngono, Brian Tata and Kemjou Tamatieu are three important players who I struggle to find information about. Tamatieu was part of the Cameroon U-20 national football team earlier this season.